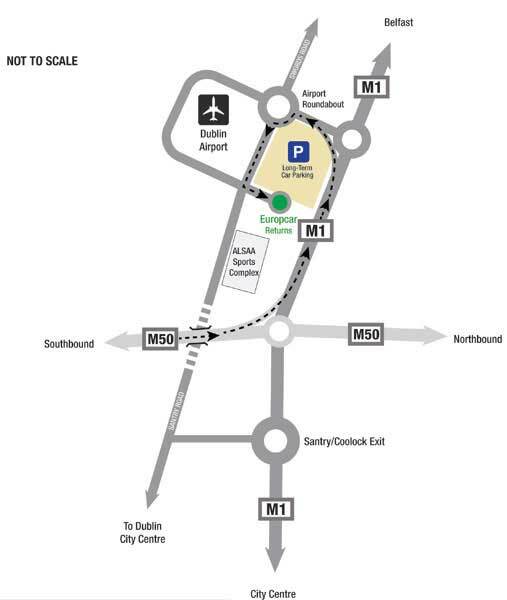 Where do I return my car to at Dublin Airport? If you are returning your Dublin Airport rental car, give yourself plenty of time so you are not rushed. The drop off area is less than five minutes from the main terminal buildings. A complimentary shuttle will drop you to the door of the airport. Take the M50 North to M1, on the M1 take the exit for the airport. Stay in the left hand lane and follow the road around to the left. Go straight for approximately 500m and take a left then right at the roundabout and drive until you see the Europcar.ie compound. On the M1 take the exit for the airport. Stay in the left hand lane and follow the road around to the left. Go straight for approximately 500m and take a left then right at the roundabout and drive until you see the Europcar.ie compound. Live departure Dublin Airport information for both Terminal 1 and Terminal 2 can be found on airport websites. This service is always up to date on flight times and delays. What to expect when returning a car? When you arrive to drop off your car, a member of staff will greet you and check over the car, see how much fuel is in the tank and sign you off. You will then be transported to the airport by a complimentary shuttle bus which takes little to no time at all. Can I return a car at another location? You can return the car at any of our rental locations however charges may apply. You will be able to see what charges may if you check on the booking engine. Our other locations are Dublin City, North Dublin, Navan, Athlone, Cork Airport, Galway, Shannon Airport, Kerry Airport and Knock Airport.